"This is a crude attempt to peddle lies." 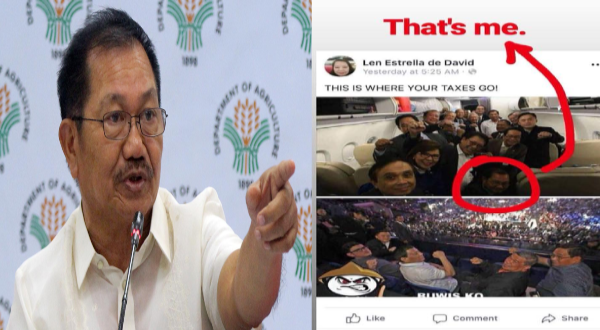 Agriculture Secretary Manny Piñol lambasted the person who spread a photo of President Rodrigo Duterte along with his staff to watch a boxing match of Senator Manny Pacquiao, and called the photo fake, with him being in it. Piñol said that the photos which were shared by a Len Estrella David where the President was seen in the Malaysia to watch the fight of Senator-slash-boxer Manny Pacquiao with Lucas Matthysse two days ago, and another photo featuring other government officials, including the agri sec. "This was fakery at its worse. Why? It is because I appeared in the photo!" he said, adding that the truth is that he was at home for his son's 16th birthday, and not in Malaysia watching the boxing match. He said that the President indeed went to watch the fight, but it was a private trip, but then it lead to a meeting with the prime minister. "First, it was as a private trip by the President to watch his friend, Manny Pacquiao fight Argentinian champion Lucas Mathysse.But just the same, he made full use of the private trip by meeting with newly-elected Prime Minister Mahathir Mohammad," he said. As the picture of Duterte showed him with more staff, he said, " Was the President escorted by the members of the Presidential Security Group? Of course! That is their job. In fact, the President is guarded by the PSG 24/7." "The photo is genuine but the caption is a fake!," he added. The post by Estrella David was screen captured by Piñol and he drew a circle on his face, captioning it "That's me". "I was not in Malaysia! The photo is genuine but the caption is a fake!"